This story was updated at 12:27 p.m.
EPA boss Scott Pruitt's top communications staffer is leaving the agency as the embattled administrator continues to come under fire for allegations of ethics lapses. Liz Bowman, who joined EPA’s public affairs office in March 2017, is leaving next week to work as communications director for Sen. Joni Ernst (R-Iowa). Bowman has been leading the press office in an agency that's been under siege in recent weeks as allegations have come about Pruitt being too cozy with lobbyists, misusing taxpayer cash and sidelining staffers who oppose him. Before joining EPA, Bowman worked at the American Chemistry Council, where she handled issue and advocacy communications. She also worked at public affairs firm HDMK and at the Pew Charitable Trusts. 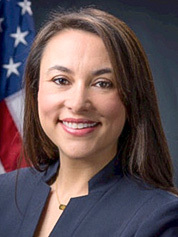 After joining EPA in March, Bowman was named the office's acting head by June 2017. She permanently took on the top public affairs job last August. "I leave extremely thankful for the opportunity to serve the Trump Administration and Administrator Pruitt," she told E&E News today in a statement. "Being a member of the EPA team has allowed me to further my skills, learn from my mistakes, and make lifelong friendships. It has also provided me the opportunity to develop a new, and deep, respect for the public servants who serve the American people, day in and day out, to ensure that we all have access to clean air, land, and water." Ernst spokeswoman Leigh Claffey said today in an email, "Ms. Bowman brings years of invaluable experience in public affairs and public relations, and we are thrilled for her to lead the senator's communications operation." It's unclear who will take over for Bowman in EPA's press shop. Bowman is the latest of several top Pruitt aides to leave the agency. One of his close advisers, Albert "Kell" Kelly; the head of his security detail, Pasquale Perrotta; and his policy director, Samantha Dravis, have also resigned.